“The were-eagles and our kind have been at war since the beginning of time. Well, it’s more like fifty years since we’d decided to move into town, but it feels like an eternity already. And they’re not were-eagles, just like we’re not werewolves. They’re more like crows, and we look more like dogs. Mutts, they call us. In a city where two shifter clans reside, the Mayor is struggling to maintain peace while keeping the population safe. Through a series of short stories, we discover what happens when intruders appear, humans get turned, the Mayor’s reputation is at stake, an invasion is planned, and not everything is what it seems. “ The were-eagles and our kind have been at war since the beginning of time. Well, it’s more like fifty years since we’d decided to move into town, but it feels like an eternity already. And they’re not were-eagles, just like we’re not werewolves. They’re more like crows, and we look more like dogs. Mutts, they call us. Times are changing and we do what we can to adapt in order to fit in. When you’re like us, social acceptance really is a problem. But we still have claws and fangs, and they have beaks and talons that can rip their enemy to shreds in seconds. Maybe it’s in our genes. Whenever we meet, it’s a miracle it doesn’t end in a bloodbath. It’s a good thing we rarely die, or there would be dead mutts all over the streets. Dead crows too. We’re a good match. They reign over the hills, while we rule downtown. This way, our territories are separated, and we don’t have to interact with each other much. Unless we want to… which, believe me, we don’t. So I was quite surprised when I heard the screeching noise coming from my window in the middle of the night. I mean, I lived on the seventh floor of what might be considered a skyscraper. There was no way to get to my window unless you had wings. At first, I ignored the sound. But it was one of those new moon nights, and moonless nights are like PMS to us. They make us cranky, edgy and damn right obtuse. It’s like a part of us, deep inside, fears we’re never going to see the moon again. And without a moon, there’s no change. Rubbish, I know. But at some unconscious level we still fear it. We can’t help it. We all have our own way of dealing with it. I was curled up in bed with the TV on, but the sound muted as I was trying to fall asleep. The key word here was “trying”, which became “failing” when the discreet knocking turned into a loud screeching noise similar to a set of fingernails running over a blackboard. Growling, I fished the remote control from between the sheets and turned off the TV. That left me in semi-darkness, and with a well-calculated jump, I landed next to the wall encasing the window. The floor was cold underneath my bare feet. If I’d had a tail at the moment, I would have twitched it in annoyance. I pulled the curtains out of the way and opened the damn window. A cool breeze slipped into the room, bringing in scents of water, dead fish, and rusted wood from the nearby river. There was also a faint scent of pine and linden trees that were specific to the hills in the north-west part of the city. The black bird perched on my windowsill tilted its head and looked at me. It was a big crow, about the size of a raven, but still a crow. I fought the impulse to bare my teeth at it. Its head bobbed up and down as if asking for permission to enter. At least it hadn’t just barged in. I rolled my eyes and took a couple of steps back. Would it be too much to hope for the visit to end before I got the urge to kill it? Too late already. A moment later, a naked man stood leaning against my curtains. The streetlight cast a glow on his body, obscuring his features, but it was clear that he was tall and well built. I sized him up. Could he be stronger than me? That remained to be seen. For now, he was still panting, trying to recover after the change. It would have been the best time to attack, but I wasn’t going to do it, not yet. I was curious about the reason that had brought him there. It wasn’t like we had that much in common. I was pretty sure we hadn’t met before. He inhaled deeply, unamused with my lack of cordiality. What did he expect, drinks and cake? “It’s about the Mayor,” he said. What did I have to do with the Mayor? He was one of the supporters of the community’s Youth Center, but other than seeing him once at the opening festivity, I hadn’t met him. We hadn’t even shaken hands. The checks arrived monthly in the mail, though, so I didn’t miss him one bit. As long as he kept his nose out of my business, I was perfectly happy to keep mine out of his. I wrinkled the said nose. Such information had not reached our quarters, and we had people infiltrating in his personal circle. We would have heard something. “He claims we’re frightening the people living on the outskirts of the city,” my visitor added. The Mayor wasn’t wrong. Stumbling into a pack of big, scary wolves running like mad in their woods was terrifying all right. Dogs running wild in the same woods didn’t look any better. We scared them more than the crows, to be honest. That’s why we only ran in the forest and avoided the fields and the small towns surrounding the city. “So?” I shrugged my shoulders. Maybe it was time to end the stupid Chase. No one won anyway. Ioana Visan has always dreamed about reaching the stars, but since she can’t, she writes about it. 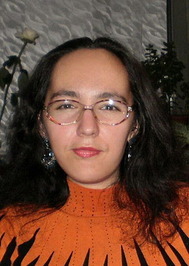 Her stories have been published in several Romanian anthologies and magazines. Her English debut came with the short story “Unhinged Reality” published by Every Day Fiction. “Human Instincts” is her first novella in English and she also has a story included in “Evolution: Vol. 2” anthology published by Evolved Publishing. She is currently working on a fantasy trilogy.